Busting through box office records at the speed of a marauding T-Rex, Jurassic World has proved there's more than enough life left in the Jurassic Park franchise. 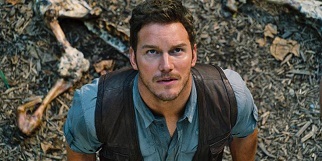 The fourth movie in the hit dinosaur series, Jurassic World sees Safety Not Guaranteed filmmaker Colin Trevorrow in the director's chair, with franchise godfather Steven Spielberg taking a backseat as an executive producer. The story follows on from Spielberg's groundbreaking 1993 blockbuster, sidestepping the events of both 1997's The Lost World and 2001's Jurassic Park III by depicting a fully-fledged dinosaur theme park on the tropical island of Isla Nublar. 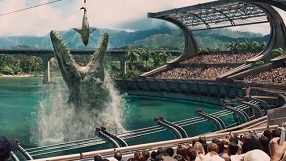 The attraction has been up and running for 10 years and boasts such spectacular attractions as an aquatic Mosasaurus display; however, with visitor numbers flagging, the park's typically foolhardy scientists have decided to create a fearsome, genetically modified hybrid named the Indominus Rex to terrify the tourists out of apathy. 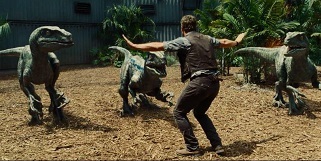 Needless to say, the beast escapes to go on the rampage and endanger the park's visitors, with beleaguered humans Chris Pratt (whose character Owen has a pack of trained Velociraptors at his disposal), Bryce Dallas Howard, Irrfan Khan and others caught up in the melee. Slyly acknowledging a 21st century audience's desire for everything to be cranked up to 11, especially in terms of effects and spectacle, Jurassic World cannot possibly hope to live up to Jurassic Park but it's a slickly engaging adventure nonetheless with likeable characters and more than enough moments of Spielbergian wonder. The original Jurassic Park casts an enormously long shadow in more ways than one. Not only do its special effects continue to overshadow the vast majority of those seen in the modern age (a result of sparingly used CGI combined with breathtaking models and animatronics); it also elicited an extraordinary score from veteran composer John Williams, quite possibly the finest of his illustrious career. It was the twelfth collaboration between Williams and Spielberg, a partnership that had already encompassed Jaws, E.T. and the original Indiana Jones trilogy, but even so Williams went above and beyond the call of duty, mixing the melodic, soaring beauty of Hook with the more challenging and frightening textures heard in the likes of Close Encounters of the Third Kind and Born on the Fourth of July. The result was an immensely satisfying album experience that had one foot in the nostalgic traditions of previous Williams classics whilst also anticipating the heightened emotional complexity and maturity that was to dominate his music throughout the rest of the 1990s. It was a remarkable decade for the composer with noteworthy highlights including the Oscar-winning Schindler's List, Nixon and Angela's Ashes; Jurassic Park would turn out to be the score that bridged his largely exuberant offerings from the 1980s with these darker, more grown up works. That makes it a crucial entry in the Williams canon: beautifully orchestrated, meticulously constructed, by turns beautiful, thrilling and terrifying. It's therefore a lot for Jurassic World composer Michael Giacchino to live up to. However, he's well-suited to the job for a number of reasons. Firstly and most importantly, he has emulated the style of Williams frequently and effectively throughout his career, from the sweeping Medal of Honour video game scores to the soaring beauty of Super 8. Giacchino also has past form with Jurassic Park, having scored The Lost World Playstation game back in 1997. 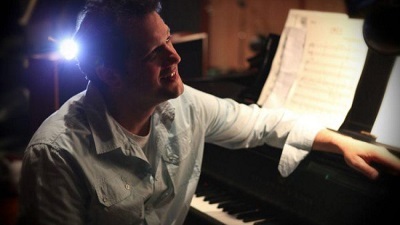 And taken as a composer on his own terms, Giacchino has proven himself a master of the modern day adventure score, having lent vigorous energy to such movies as Mission: Impossible, Star Trek and this year's Tomorrowland. So, whilst there was never a chance of the Jurassic World score toppling that of Jurassic Park, it nevertheless makes for a very fine soundtrack indeed. In terms of satisfaction, it's more engaging than Williams' own sequel score The Lost World, which suffered from longueurs, and surer of its own identity than Don Davis' Jurassic Park III, which quoted Williams' own ideas frequently at the expense of generating new ones. Giacchino graces his score with three primary themes, the first of which emerges in the eerie introductory track "Bury the Hatchling": prickly harp scales, ghostly woodwinds and strings and a desolate choir call to mind Williams' more foreboding material, as Giacchino introduces the identity for the dreaded Indominus Rex. It's an insidious, threatening piece that will stalk its way through the remainder of the album. By contrast, "The Family That Strays Together" is altogether more perky and lively, calling to mind the optimism of Super 8 and acting as a thematic representation of on-screen brothers Zach (Nick Robinson) and Gray (Ty Simpkins), both of whom are visiting the park in the midst of their parents' imminent divorce. "Welcome to Jurassic World" ushers in a welcome reprisal of Williams' classic dinosaur theme from the original trilogy, Giacchino adding a heavenly choir for added majesty. However, this is one of the select few occasions where Giacchino states Williams' ideas in full: throughout the remainder of the score, he deploys the original themes at precise strategic points for maximum impact, a decision that allows his own musical ideas to come to the fore. Giacchino's central theme for the park itself arrives in standout track "As the Jurassic World Turns", a soaringly beautiful piece that hews closely to the tone of Williams' music but which also stakes out its own distinct identity. Surging strings, choir and noble horns capture the wonder of the dinosaurs in all their glory whilst lighthearted contrast from fluttering woodwinds lends a childlike sense of innocence. Indeed, some of the musical progressions sound like deliberate allusions to the original themes. It's entirely to Giacchino's credit that the piece is identifiably his own, calling to mind the more emotional moments from Lost and other acclaimed works. When the piece melds seamlessly with Williams' brassy island theme for a few seconds at the end it's pure bliss, a perfect melding of old and new. "Clearly His First Rodeo" offers the first sliver of the score's aggressive action music, Giacchino again distilling Williams' frenetic brass rhythms and racing strings whilst allowing his own voice to shine through. But the moment doesn't last: it's back to sweetness and light for the remainder of the track and the following one, "Owen You Nothing", which has more of a Thomas Newman vibe with its flirtatious, mischievous woodwinds and plucked strings. "Indominus Wrecks" is where it all kicks off, underscoring the scene where the terrifying hybrid gets loose. The quietly creeping nature of the Rex theme raises tension with its snaking, descending strings before all hell lets loose, Giacchino unleashing the full force of the orchestra in visceral, ferocious fashion. It's back to the grandiose park theme, albeit briefly, in "Gyrosphere of Influence" with the choir proving especially powerful before that theme is dialled down into a moving piano arrangement for "Pavane for a Dead Apatosaurus". "Fits and Jumpstarts" begins with a tender rendition of the brothers' theme before developing into a buoyant, lighthearted piece full of the spirit of adventure. 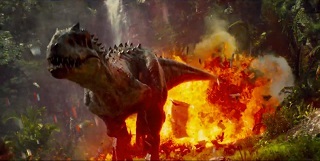 However, it's merely an entrée for the two of the score's action highlights that follow, "The Dimorphodon Shuffle" and "Love in the Time of Pterosauria" (the best of Giacchino's typically quippy track titles): fearsomely intense and visceral tracks that swoop and dart and create all kinds of orchestral ruckus. Further enjoyable throwbacks to Williams' action music style include the undulating harp that could be taken straight from Jaws and the ostinato brass rhythms that battle with each other in thrillingly frenzied ways. And the action doesn't stop there: "Chasing the Dragons" is another powerfully rhythmic creation, barrelling forward off the back of a defiant brass theme representing Owen's trained raptors who are utilised to help hunt down the Indominus. The tapping bongos and jungle percussion beneath meanwhile evoke the film's location perfectly. The menace of the Indominus Rex theme then leads into the dynamic assault of "Raptor Your Heart Out", strings lunging forward with the aggressiveness of a prehistoric creature as the brass section lends even more bite. The rollicking orchestral writing calls to mind, perhaps intentionally, Williams' work on the original Indiana Jones trilogy, particularly The Last Crusade; it's blood-pumping stuff. Cleverly, Giacchino also interweaves a brief snippet of his raptor theme from The Lost World video game for a sneaky bit of film music in-jokery. As the score reaches its conclusion, the action becomes ever more spectacular with "Costa Rican Standoff" and "Our Rex is Bigger Than Yours" featuring some of the finest writing in Giacchino's career so far. From the frenzied tribal drumming and screeching woodwinds of the former to the dramatic choral outbursts of the latter, the composer gives a potent sense of an epic prehistoric tussle as events come to a dramatic head. Racing strings, choppy brass and vocals are interspersed with spine-tingling renditions of John Williams' key ideas, including the island theme and, pleasingly, his underrated main theme from The Lost World. The references are fleeting but establish a satisfying sense of franchise continuity. "Growl and Make Up" finally introduces a bit of downtime with a noble rendition of Giacchino's main theme before the score ends in the best possible fashion with the powerful duo of "Nine to Survival Job" and "The Park is Closed" (which begins with a final, stately take on Williams' dinosaur piece). This is where Giacchino's theme soars to stunning heights, stirring strings and choir bringing everything to a hugely emotional conclusion. When experienced in combination with the film's awesome closing shot (not to be spoiled here) it becomes even more magical, the perfect marriage of image and music. 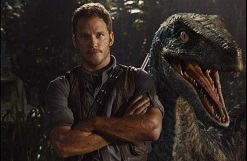 "Jurassic World Suite" is a summary of the score's key ideas with further variations on the chilling Indominus Rex theme and the militaristic, adrenaline-pumping raptor squad piece. 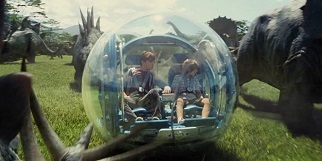 There then follows a selection of source music heard within the film itself for the various Jurassic World attractions, with the fourth and final "Sunrise O'er Jurassic World" in fact composed by Giacchino's son, Mick. Fingers crossed he will follow in his father's footsteps and go on to create equally excellent music. Given the intimidating legacy of John Williams' masterful Jurassic Park and the intermittent highlights of the two sequel scores, it's commendable how coherent and striking Jurassic World is. 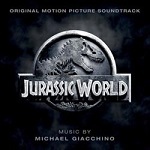 Over the past few years Michael Giacchino has become increasingly confident in establishing his own voice, striking an effective balance between the composers he admires and his own rigorously orchestral, nostalgic approach; the Jurassic World score is perhaps the best demonstration of this so far in the composer's career. Honouring the multitude of thematic ideas that have come before whilst also ensuring his own creations stand on their own hind legs, Giacchino has fashioned a score that honours the franchise whilst taking it in new directions. He has clearly studied the tonality and instrumentation of Williams' work very carefully, making sure that his new themes are consistent with the earlier scores whilst also reminding listeners of such masterful works as Star Trek and Super 8. This was a soundtrack that had to please a number of masters and although many will no doubt quibble with the relatively brief airtime given to Williams' ideas, the level of restraint in this area in fact works to its favour, emphasising the fact that this is a Giacchino score first, a Williams score second. Quite possibly the composer's finest work to date. The film score album is available from these links at Amazon.com and Amazon.co.uk. It was also recently announced that the score is to receive a vinyl pressing, due for release in September 2015 (see preview here).